The Samsung Galaxy Tab Music app categorizes your music by album, artist, song, and so forth, but unless you have only one album and enjoy all the songs on it, that configuration probably won’t do. To better organize your music, you can create playlists. Choose the Playlist category from the Category menu in the Music app. Touch the Add button in the upper-right corner of the screen. The new playlist is created and placed into the Playlists screen. You don’t need to play the song, simply display the song in the Music app. Likewise, you can hunt down albums, artists, or even genres. The technique described in this set of steps works for every category in the Music app. Choose the command Add to Playlist. 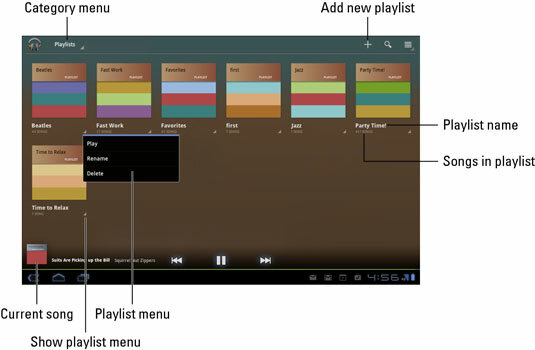 You can have as many playlists as you like on the Galaxy Tab and stick as many songs as you like into them. Adding songs to a playlist doesn’t noticeably affect the Tab’s storage capacity. To remove a song from a playlist, open the playlist and touch the menu triangle by the song. Choose the Delete command and then touch Ok to confirm. Removing a song from a playlist doesn’t delete the song from the Galaxy Tab’s Music library. Songs in a playlist can be rearranged: While viewing the playlist, use the tab on the far left end of a song title to drag that song up or down in the list. To delete a playlist, touch the menu triangle in the playlist icon’s lower-right corner. Choose the Delete command. Touch Delete.